It has recently been reported that the so-called Islamic State in Iraq and Syria (ISIS) has no territorial gains left in either Iraq or Syria, however it would be a major understatement if one chooses to argue that this terrorist group is no longer a threat. According to the data presented by the notorious American think tank RAND, over a period of a little more than a decade from 2004 to 2016, the EU lost well over 180 billion euros in both lost income and expenses associated with terrorism. Out of all of the member states, Great Britain and France suffered the largest losses, amounting to 43.7 billion euros and 43 billion euros respectively, followed by Spain (40.8 billion euros) and Germany (19.2 billion euros). According to the info released by the British Anti-Terrorism Police, last year alone a total of 441 people faced terrorism charges across the country. In total, since the 9/11 attacks, this government body arrested 4,182 terrorist suspects. In his recent interview with Focus, the president of the German federal office for the protection of the constitution, Hans-Georg Maaßen stressed the fact that the threat that ISIS still poses should not be underestimated under any circumstance. After facing a number of crushing military defeats, he said, it would only be logical to assume that this terrorist group was going to concentrate its efforts on launching attacks outside the Middle East, especially in Europe, since it needs to demonstrate that it hasn’t been knocked out completely. This opinion is confirmed by the data published by Europol, according to which the number of terrorist attacks carried out by radical Islamists in Europe is growing steadily and has more than doubled over the course of last year. At the same time, such terrorist attacks are becoming increasingly cruel, resulting in heavier civilian casualties. In total, 975 people suspected of terrorism were arrested across the EU last year. A recent public opinion study released by the YouGov research company shows that immigration and terror are the two most important topics for residents in 9 out of 11 European countries chosen for the study. It’s hardly surprising that immigration remains a major concern among Europeans, as demographics are becoming too uncomfortable for local residents to stomach. For example, only 1 in 3 inhabits of Amsterdam younger than 15 years of age is ethnic Dutch. This can be explained by the fact that foreigners tend to have more children, they deliver them earlier, which makes foreigners an overwhelming majority among younger demographics. Even if immigration was brought to a screeching halt today, Muslim communities will still continue to grow faster than indigenous populations. The number of Muslims dwelling in Western Europe is bound to double by 2050, according to the PEW research center. In France, according to the same source, this number will grow from 9% of the total population to 17.4%. This means that the state of emergency that is being regularly announced by Paris will become a permanent thing. According to the data presented in the Europol’s annual report for last year, at least 400 Islamists are arrested every year in France. Over the course of the last decade, Western security agencies have managed to prevent well over 9 thousand terrorist attacks across the EU. According to German intelligence agencies, in recent years, more than 9,000 malicious terrorist plots against European countries have been successfully uncovered. It’s curious that the study presented by the Soufan Center tells us that out of 5,778 people who departed at a certain point in time from Western Europe to wage “jihad” overseas, a total of 1,200 have safely returned home. The majority of those are now residing in the UK, France, and Germany, and it seems that Europeans have already got a taste of the consequences of these recent homecomings of terrorists. The Swiss Federal Intelligence Service (FRS) has also prepared a report on the level of Islamist threat across Europe raised by the return of radicals from conflict zones in Syria, Iraq and the Sahara-Sahel region. Last year, a total of nine terrorist attacks were successfully committed in France, with Spain and Belgium lagging behind with two terrorist attacks each, and Sweden, Finland and Germany closing the list with no more than one terrorist attack each a year. However, there were nine unsuccessful attempts to commit acts of terrorism, which is turning into a problem for Switzerland, which remains an international financial center that has to develop new approaches to monitoring banking transfers of radical Islamist groups. However, one can see clearly now that the West has no intention of eradicating the threat of radical Islamism, as this would deprive NATO of a pretext to carry on its military presence in North Africa and the Middle East. That is why such terrorist organizations as ISIS continue receiving funding and weapons from Western NGOs and certain intelligence agencies. In particular, this fact has been confirmed by the Syrian Arab army discovering stockpiles of American and Israeli produced weapons and munitions in the Governorate of Quneitra after forcing the so-called White Helmets to abandon them. Recently, these illegal arms supplies to anti-government forces in Syria were resumed by the CIA. To be more specific, there are reports that last July, a Danish company, H. Folmer & Co., resumed the delivery of Bulgarian-produced weapons to Saudi Arabia, from where they are being smuggled to radical militants in Syria, confirmed by the data provided by Marinetraffic. Ukrainian officials have also been re-launching smuggling operations by using the guise of an American firm called Alaska Reefer Managment registered in Seattle. In particular, a bunch of independent investigative journalists hasve recently announced that food containers shipped by this company to Syria, Iraq and Lebanon from the Ukrainian port of Nikolaev didn’t contain sausages or chicken legs as stated, but were filled to the brim with missiles. Further still, European media activists have discovered more than 180 Islamist organizations in Europe operating under the guise of non-governmental human rights associations that promote the idea of establishing a global “caliphate” and fighting opponents of European Islamization. The most ironic part is that they finance their activities with money stolen from European taxpayers. 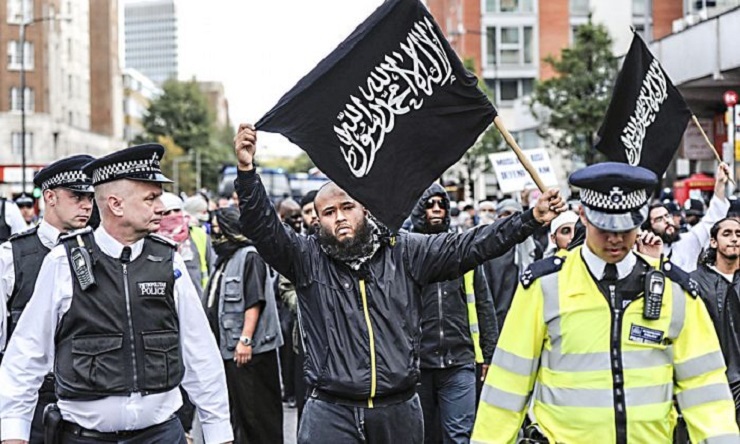 The largest number of Islamist movements can be found in the UK – 84. Followed by Germany, Austria, Switzerland, Belgium and France. One of the fundamentalist trends in Islam, Salafism, is becoming increasingly common in Sweden. According to the Islamic Map activists, the lion’s share of Islamist organizations were created and are now controlled by a group with Egyptian roots, the Muslim Brotherhood, along with the Palestinian Islamist movement Hamas, and Turkey’s Directorate of Religious Affairs . One public organization associated with the Muslim Brotherhood has received over 6 million euros over the past six years, which was used to sponsor the fight against its opponents. As for the role Western countries continue playing in the sponsoring of terrorism, it is impossible to ignore the recent scandal in the Netherlands triggered by a journalistic investigation that revealed local authorities providing assistance to terrorist groups operating in Syria. According to media reports, the total amount of the so-called “non-lethal assistance” to terrorists provided by local government bodies amounted to 25 million euros worth in uniforms, satellite phones and pick-up trucks. There’s an investigation under way, but even now it is clear that the support of anti-government forces in Syria was provided in complete disregard of international law. Thus, as long as European and American political elites do stop feeding the monster that has consumed thousands of human lives, there’s no putting an end to ISIS even if it no longer holds significant territory.